It wasn't because of World War I. 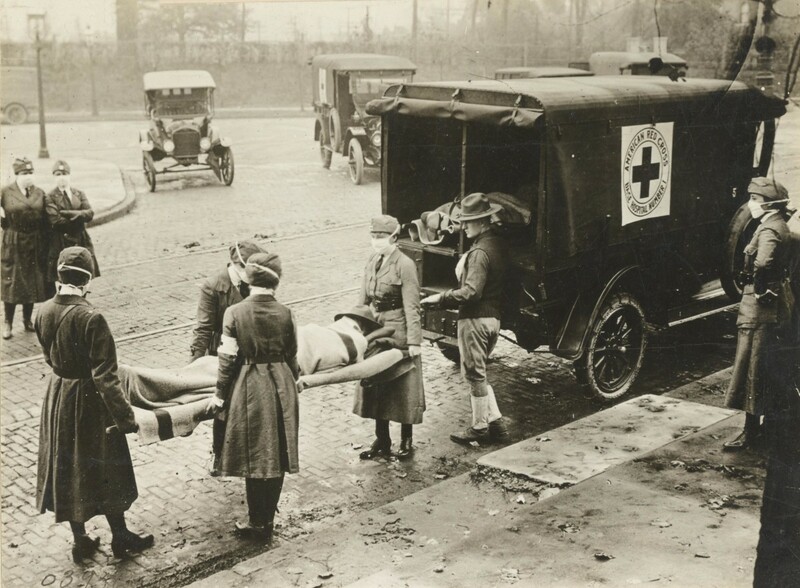 The St. Louis, Missouri Red Cross Motor Corps on duty during the 1918 influenza epidemic. 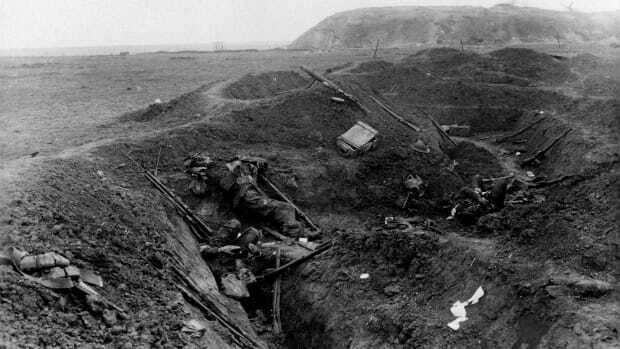 While war engulfed the globe in the early autumn of 1918, Roy Grist watched as the bodies of fellow soldiers piled up inside a makeshift morgue. 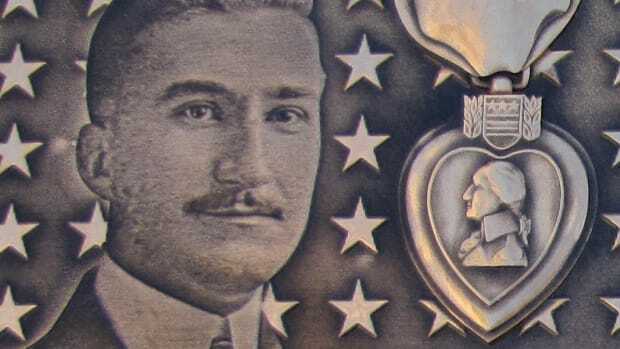 As the U.S. Army doctor wandered through the double rows of dead doughboys, he struggled to comprehend how young men, so full of life only days earlier, had been cut down in their primes. It would have been understandable if they had been felled by German guns on the Western Front, but these soldiers had died from a mysterious disease at an army camp northwest of Boston. “It beats any sight they ever had in France after a battle,” Grist wrote of the devastation he witnessed at Camp Devens. In the weeks to come, the situation only grew worse, much worse. October 1918 would become the deadliest month in American history as a contagion the likes of which had not been seen since the days of the Black Death raged across the country and around the world. 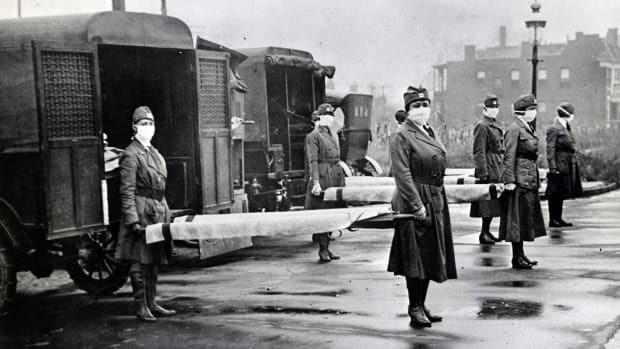 The first officially recorded case of what has been called the “mother of all pandemics” occurred in early March 1918, at a U.S. Army training camp in Kansas. After mess cook Albert Gitchell complained of flu-like symptoms in the morning, another 107 soldiers followed by lunchtime. Five weeks later, more than 1,000 soldiers had been infected and 47 were dead. The deadly influenza tore through the overcrowded army training camps populated by one million new recruits, and the doughboys sent to Europe in the spring of 1918 carried with them infinitesimal microbes that proved as lethal as their guns. 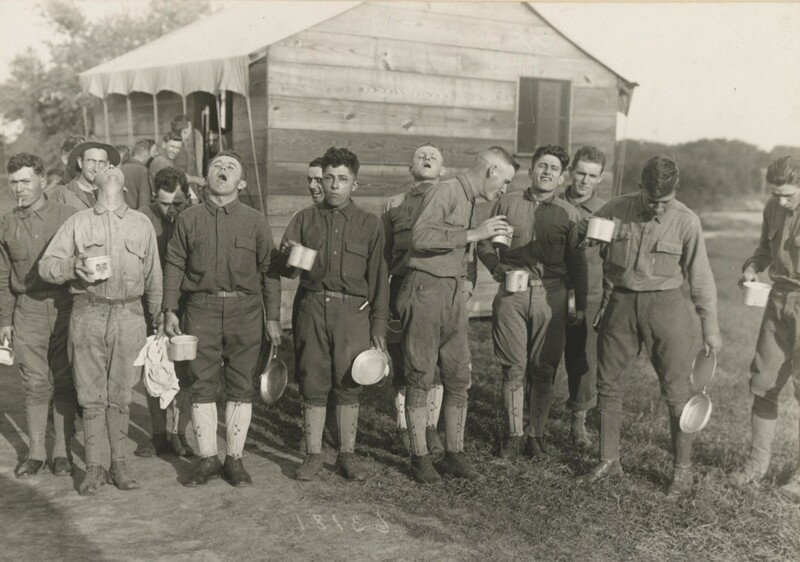 Men gargling with salt and water at Camp Dix in New Jersey as a preventive measure against the influenza epidemic of influenza. After subsiding over the summer, a second, even more powerful wave of influenza swept across the United States after two sailors in Boston contracted the illness. The flu quickly reached nearby military installations such as Camp Devens before spreading to civilian populations across the country. Working 16 hours a day, Grist saw patients who arrived with coughs, sore throats and high fevers “very rapidly develop the most viscous type of pneumonia that has ever been seen.” Within hours, mahogany spots dotted soldiers’ cheeks before their faces turned such a dark shade of blue or purple from a lack of oxygen in their blood that Grist reported it became “hard to distinguish the colored men from the white.” Patients bled from their noses and ears, gasped for air as fluid filled their lungs and eventually suffocated from their own mucus and blood. The flu&apos;s cause was a mystery. The outbreak confounded Grist and his fellow doctors. “There is no doubt in my mind that there is a new mixed infection here, but what I don’t know,” he wrote. This influenza strain was more virulent than any seen before or since, and instead of striking the very old and the very young, it cut down otherwise healthy, young adults such as the soldiers preparing for war. 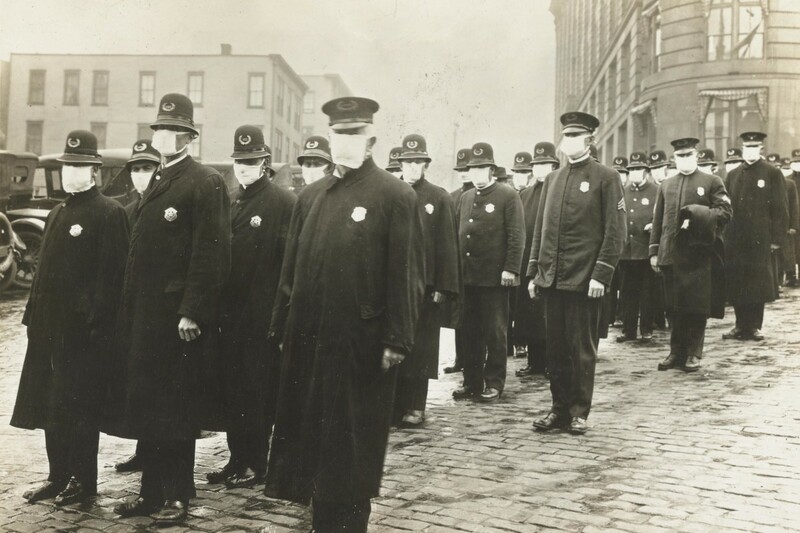 Policemen in Seattle, Washington wearing masks to prevent catching the flu. In some cases, more concerned about the spread of panic than the flu itself, public health authorities downplayed the risks. “There is no cause for alarm if precautions are observed,” proclaimed U.S. Surgeon General Rupert Blue. 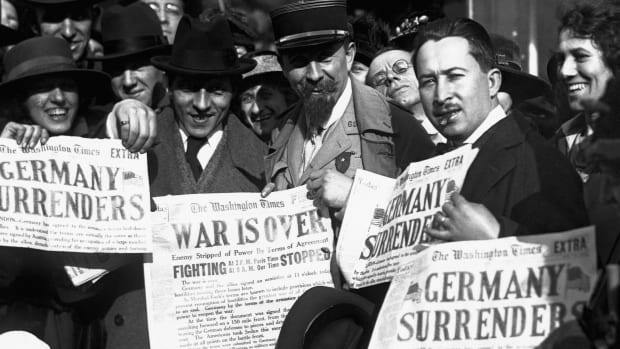 Not wanting to run afoul of censorship laws that called for up to 20 years in prison for printing anything the government deemed detrimental to the war effort, newspapers under-reported the rapid spread of the pandemic. While news of the influenza was suppressed in the United States, France and Great Britain, that was not the case in Spain, which remained neutral in World War I. Wire service reports of a flu outbreak in Madrid in the spring of 1918 led to the pandemic being called the “Spanish flu,” even though it originated elsewhere. Cities scrambled to contain the outbreak. Life in much of America came to a standstill in October 1918 as municipalities shuttered public gathering places such as schools, churches, theaters and saloons. 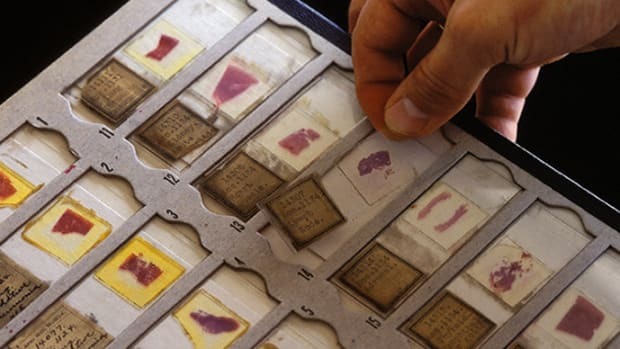 With the Centers for Disease Control and Prevention still decades away from establishment, however, responses to the pandemic varied from city to city. In San Francisco, judges held court sessions outside in public squares, and citizens who did not wear protective gauze masks—dubbed “mask slackers” by the press—could be fined $5 or even sent to jail. “Obey the laws, and wear the gauze,” urged public service posters. Arguing that children would be safer surrounded by school nurses than at home, New York City Health Commissioner Royal Copeland chose to keep schools open along with other public venues. In one concession, Copeland mandated staggered opening and closing hours of businesses and factories in order to minimize rush-hour crowds on subway trains. 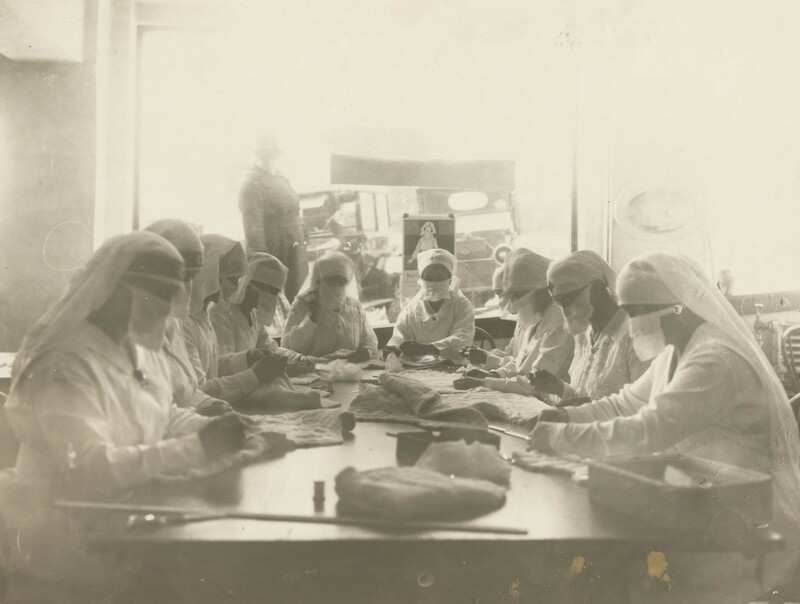 Nurses at work combating the influenza epidemic at the Red Cross in Seattle, 1918. Over 11,000 Philadelphia residents died in October 1918, including 759 on the worst day of the outbreak. Drivers of open carts kept a near-constant vigil circling streets while hollering, “Bring out your dead!” They then deposited the collected corpses in mass graves excavated by steam shovels. The Spanish flu led to record death tolls. After taking the lives of 195,000 Americans in October 1918, the Spanish flu dissipated as quickly as it had arrived, although it had a brief resurgence after crowds flooded city streets to celebrate the November 11 announcement of the armistice. Between war and sickness, life expectancy fell from 51 to 39 years of age in 1918, according to Davis. By the time it abated in 1920, the Spanish flu had killed 675,000 Americans and left hundreds of thousands of children orphaned. Not only did more Americans die of the Spanish flu than in World War I, more died than in all the wars of the 20th century combined. 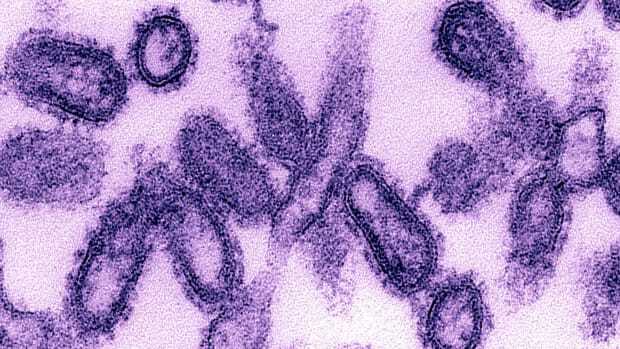 Globally, the pandemic infected a third of the planet’s population and killed an estimated 50 million people.